West benefit TODAY at la Barbecue!!! I hate that there is a reason to throw a benefit, but I am so looking forward to today's event at la Barbecue (11a-2p), in hope that we raise a bunch of money for the victims of the tragedy in West. My SINCEREST thanks to everyone who has helped with planning the event, everyone who has posted about it online, everyone who has already donated money, & everyone who joins us today. If you can't make it but want to follow along, I will tweet updates from @ManUpTexasBBQ. Let's help West!!! UPDATE: We've raised more than $4,000 & counting!!! Here's a fantastic recap of today's benefit, courtesy of Full & Content. 5. 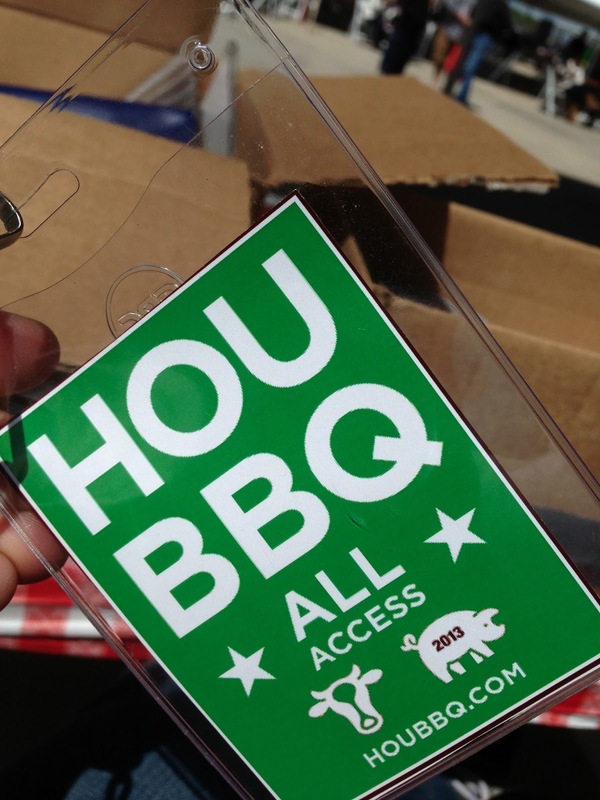 Gloria Corral will be at the event selling copies of her book "BBQ Lovers Guide to Austin." She will donate 100% of the proceeds! 8. 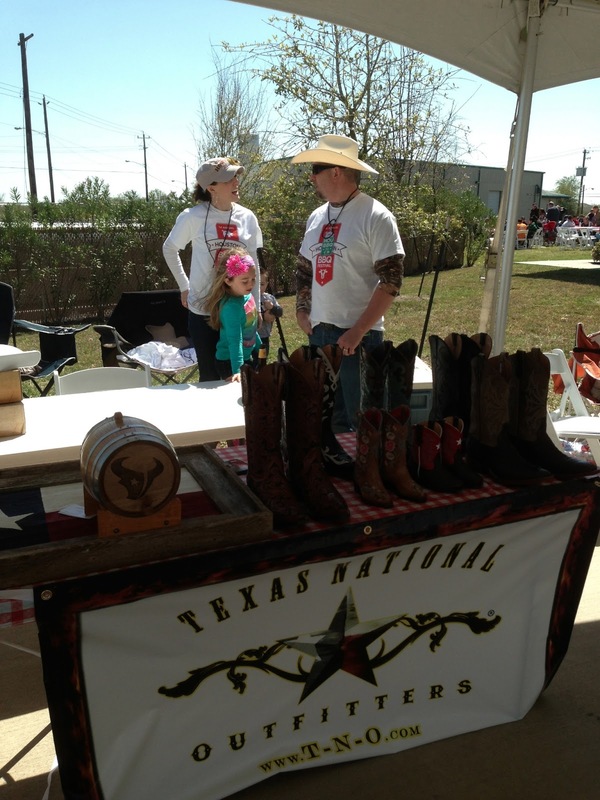 Stephen Joseph, owner of Joseph's Riverport Barbecue (Jefferson, TX), is donating 100 koozies & a case a rib rub for the event! 9. Junior's Beer and Wine is donating 3 kegs of beer! Our sincerest thanks to all of the above. We are truly grateful for your donations. IF YOU WANT TO DONATE TO OUR EVENT, PLEASE EMAIL ME ASAP!!! 3. A local wine importer is donating cases of red wine and white wine. Levi Smith's Pitmaster Class at Thirsty Planet Brewing! Today, we announce a special, limited-seating event. Austin pitmaster Levi Smith, of Woodpile BBQ, recently began leading cooking classes, where he teaches students all about smoking a brisket - from selecting the wood to cutting the finished product. Well, we're teaming up with Levi, Thirsty Planet Brewing, & Little Fattys Gordita Cocina to bring you a one-of-a-kind event. The class will last from 6:30-8:30. Topics to be covered include meat selection, wood selection, meat trimming, rub application, controlling temperature, time, moisture, etc., and more. We'll have Thirsty Planet, Little Fattys, & Levi all to ourselves. 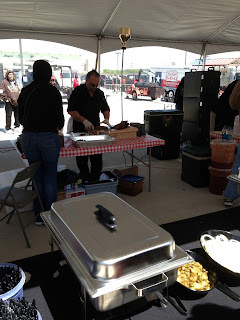 Hot gorditas, cold Texas craft beer, & a class on how to smoke a brisket. What better way to spend a Tuesday summer evening?!?! This is a limited-seating event, so snag a ticket while you can! UPDATE: This event has been canceled. Couple of weeks ago, I stopped in for my first visit to Smoke Shack, the San Antonio BBQ trailer that recently won a field-of-32 BBQ tournament for San Antonio. My order: pulled pork, quarter chicken (dark), brisket slider, pulled-chicken slider, two pork ribs. Great food, bad service. Or vice versa. I presume that the ideal for most of us is a Texas BBQ joint with great food and great service. If you're like I am, great food with terrible service just isn't the same as great food accompanied by great service. Maybe some of you don't care about great service, so long as the food tastes great. Or maybe you look more kindly upon a place whose food was bad but whose service was excellent. The owners/staff were so friendly and hospitable that you don't bad-mouth the food to others as much as you would had the service been sub-par. At any rate, I am curious to read where in Texas you find the greatest dichotomy between quality of food and quality of service. Either great food, terrible service, or terrible food, great service. Feel free to name a joint for each of these situations. 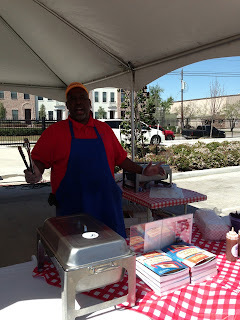 FOOD at 1st Annual Houston BBQ Festival! We've been counting the days for more than a month now. Today, we set off on an 8-hour, 6-stop Texas Q Tours trip. We're hitting up 3 BBQ joints, 2 craft breweries, & 1 coffee roaster. If you want to follow along vicariously, we'll tweet updates from @ManUpTexasBBQ & @TexasQTours. Hope you will join us on a future tour! We are overwhelmed by the number of people spreading the word about our West benefit. Sincere thanks to the Statesman & KVUE for giving us coverage. Thanks to everyone who has tweeted about it, posted it on Facebook, and told others. People I don't know are emailing me and contacting me via Twitter, offering to help. It's amazing. 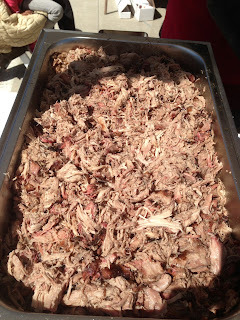 The event is next Sunday at la Barbecue from 11a-2p. 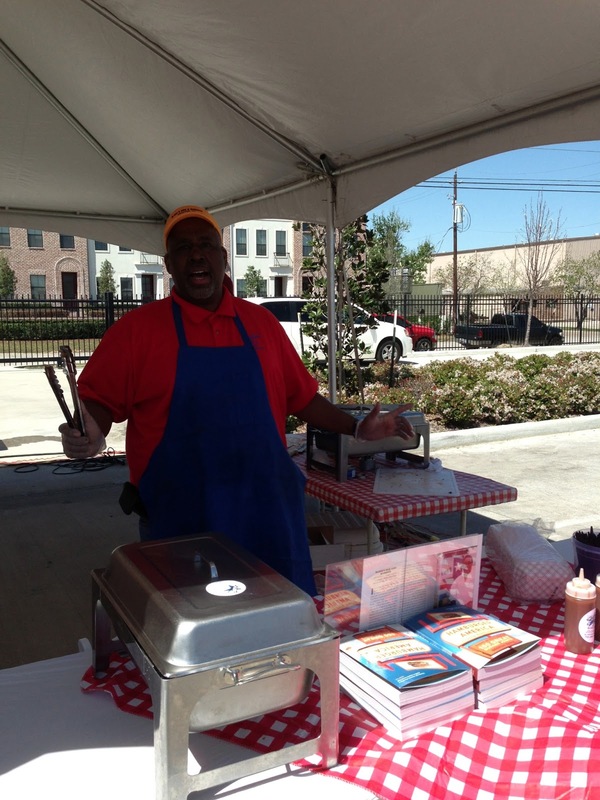 Live music, all kinds of cold drinks, free chopped-beef sandwiches, and more. Just wanted to update a bit: Several companies have contacted me to donate product. If you are a company that wishes to donate product, email me. We are so grateful for anything you can spare. Also, people who can't attend have already started sending in money donations. If you would like to do the same, you can donate via the "Send Money" feature of PayPal. Send your donation to info@manuptexasbbq.com. Like so many of you, I am terribly saddened by last night's tragedy in West, TX. We all know West, "the place with the kolaches." I stop at Czech Stop (Exit 353) for raisin bread and zucchini bread every time I pass through West. Today, my thoughts are not on kolaches or baked goods but rather what little bit we can do to help those affected by last night's explosion. To that end, we're organizing a benefit, and we hope you can join us. DONATIONS: We will accept monetary donations. We'll set up a table to receive donations. Details are still being worked out, but we will likely have a donation jar at the BBQ trailer, as well. UPDATE: We have received word that West does not need item donations, so we are shelving our plans to accept items. I tweeted last night that I would organize & advertise a benefit for the victims in West if an Austin-area BBQ joint would host it. Within 5 minutes, la Barbecue reached out to me. To Ali and all at la Barbecue: THANK YOU! Once I tweeted that a benefit was in the works, dozens of you retweeted and emailed and messaged me with offers to help with the event. I was, and am still, so moved by your kindness and goodness. To all of you: THANK YOU! And kindness and goodness are exactly what West needs right now. Again, every little bit helps. Speaking of "every little bit," let me be clear: EVERY SINGLE PENNY DONATED AT OUR BENEFIT WILL GO TO THE RELIEF EFFORTS IN WEST. People who defraud/trick/scam people during times of crisis and tragedy are sick, sick people. We hope you feel confident enough in us to help out. We have held several benefits like this in the past, and we have never taken a penny for ourselves. 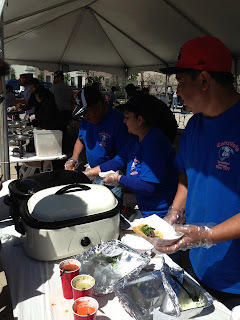 Any costs for the event will be borne by the people contributing. There will be no taking of a cut of the donations to cover expenses. I don't know specifically where we will donate the money, but as soon as I do, I will announce it, so as to be transparent. Lastly, many of you have asked how you can help if you cannot attend the benefit. If you want your monetary donation to be included with the donations collected at the benefit, you can use the "Send Money" feature of PayPal and send your donation to info@manuptexasbbq.com. Again, we will retain none of your donation. Whatever we get from people goes to West. Enter our 4th Annual Gettin' Sauced! It's that time again: Our Gettin' Sauced! entry period is underwayyyyyyyy NOW! Our 4th annual event is Saturday, September 28, at Hops & Grain Brewing in Austin. You DON'T have to be present to enter sauce(s). We are accepting sauce-contest entries through September 21. Enter by July 31, & your entry is DISCOUNTED! All of the contest's rules/regs & entry information are here. We hope to have the honor of your entry. Get sauced with us! Is BBQ the "official" food of Texas? When people think of food in Texas, do they think first of BBQ or is it something else? Chicken-fried steak? Maybe Tex-Mex? To help the case for BBQ, there aren't scores of restaurants outside of Texas that are dedicated to Texas (fill in the blank with a cuisine other than BBQ). If there were an official food of The Lone Star State, what would it be? (UPDATE: There is an official food of Texas: chili.) When most non-Texans think of Texas food, what comes to mind most often? Which Texas BBQ joint serves the best beans? Where I'm from, BBQ joints serve baked beans. Here in Texas, it's pinto. Some serve it mild. Some spicy. Some flavor with meat. Some don't. Simple question: Which Texas BBQ joint does beans best? Where's the best chopped-beef sandwich in Texas? Chopped-beef sandwich is a standard at so many Texas BBQ joints. It's quick. It's easy. It's convenient for eating on the go. It's comfortable. It reminds me of all the chopped-pork sandwiches I grew up on...well, except that the latter are superior. But I digress. Surely you've eaten loads of CB sandwiches. Which Texas BBQ joint serves your favorite? 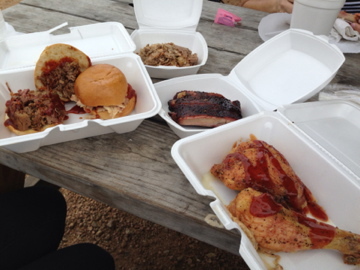 What's the most underrated BBQ joint in Austin? Previously, I asked which Texas BBQ joints are the most underrated. But with so many BBQ joints (both trailer/truck & brick-and-mortar) now dotting Austin, I am curious which spot in Austin is getting less fanfare than it deserves. 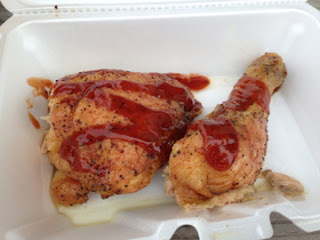 So, what is the most underrated BBQ joint in Austin? Last year, we held a USA BBQ Bracket. This year, Alabama held one. So did San Antonio. Started with 32 BBQ joints. Now, just one is left standing...and it's not a brick-and-mortar spot. The winner of San Antonio's Barbecue Madness: Smoke Shack, a food truck that, according to the article linked, is "most often in a parking lot at the intersection of Nacogdoches and Loop 410." From Dallas via Ole Miss and New Zealand, proprietor Chris Conger is making a name for himself in SATX. So, what do you think, folks? Did the voters get it right? Is Smoke Shack the best BBQ in San Antonio? 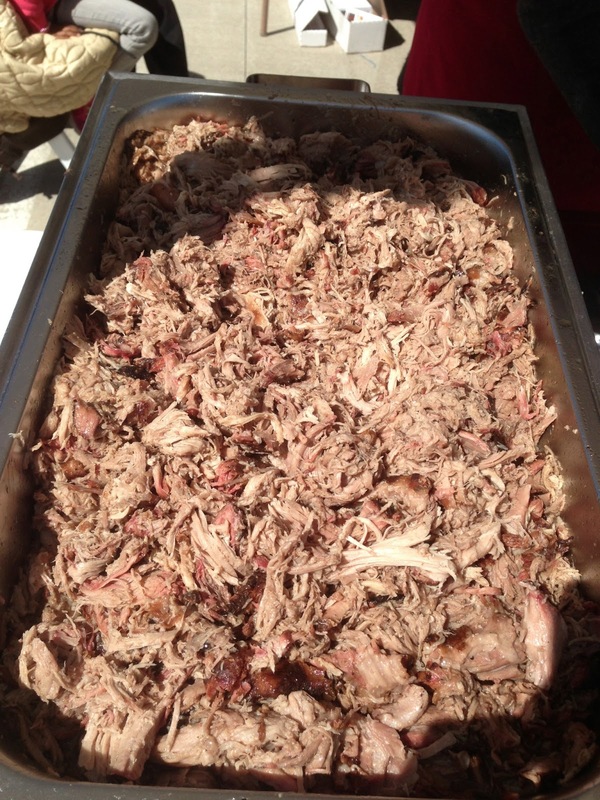 What's the best BBQ in Louisville? In honor of last night's NCAA basketball championship for the Louisville Cardinals: What is the best BBQ joint in Louisville, KY? What's your beer of choice when eating BBQ? I just learned that today, April 7, is National Beer Day; so, naturally, I'm wondering what beer folks prefer when eating BBQ. A long time ago, I asked what your DRINK of choice is when eating BBQ. Today, I ask what BEER you prefer when eating BBQ. Feel free to give different answers, based on the type of BBQ. What's your Texas BBQ Final Four? The Final Four is on tonight. It has sparked a simple question: Which Texas BBQ joints would make it to your Final Four? Best BBQ in Texas outside of Austin/Dallas/Houston triangle? Look at a map of Texas. Draw a triangle connecting Austin, Dallas, & Houston. Now, tell me where to find the best BBQ in Texas OUTSIDE of that triangle. So, excluding those 3 big cities and everywhere between (i.e. inside the triangle), what is the best Texas BBQ joint? 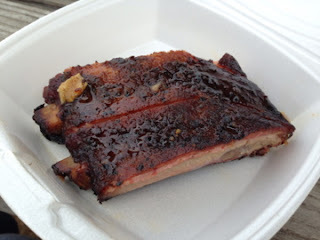 How honest/unbiased are you when reviewing BBQ? How honest are you when we react to the BBQ you eat? How unbiased are you when you sit down to take your first bite? Do you ranks/score/comment SOLELY on the taste of the food you eat, or do you allow things you have read and/or heard to influence your judgment? If you have read and heard ad nauseum about how amazing/terrible a place is, is there really any chance that your own opinion on the place will be much different? Are you blindfolded, with no idea where you are eating? Do you have 10 slices of brisket from 10 different joints in front of you, with no idea which slice is which joint's? Do you let the service affect what you say about the food? If you really like the food but don't like the proprietor, are you less complimentary of the food? If the food is pedestrian but you really like the proprietor, are you more complimentary of the food? How about this...if a place whose BBQ you don't care for served you a slice of meat from a place you love, unbeknownst to you, would you like that slice as much? And if a place you love served a slice from a place you don't love, would you dislike that slice as much? What I'm getting at is how much do you let other people -- things you read, things you hear, etc -- influence what you think about the food you eat? Would your personal Top 10 List be the same if you ate the food from "anonymous" joints? How truly honest are you when reviewing meals? Best BBQ/pizza pairing in Austin? I don't know about you, but I think Austin needs an event that features BBQ pizzas jointly made by 1 Austin BBQ joint & 1 Austin pizza joint. Brisket on pizza. Sausage on pizza. Any smoked meats on pizza, really. Live music, a charity partner, & you've got yourself a nice little event. But I digress. Back to the BBQ pizzas. Which BBQ joint & pizza joint would you pair up? One Austin BBQ joint. One Austin pizza joint. Go. Best BBQ thus far in 2013? Our annual Readers' Choice Awards aren't published until February, but I am curious which BBQ joints are in the early lead for the best of 2013. A handful of BBQ joints opened in late 2012/early 2013, as the Texas BBQ scene continues to grow. The contenders are, and will continue to be, more numerous. Will the 2013 awards look a lot like the 2012 list? Or will we see some new names? Will any new joints crack the list? Will some more senior places not on a previous list break through for the first time? Will Dallas and/or Houston finally land a place on the list, or will Central Texas sweep yet again? Tell us. What do you like in 2013? Feel free to comment on as many categories as you like!